By infusing white bread with antioxidant-rich anthocyanins from black rice, scientists have created a bread that’s low on the glycemic index and loaded with health benefits. Scientists from the National University of Singapore are rolling (kneading and rising) out a baked good “superfood”: purple bread, a new report from CNN suggests. White bread has long been banished from the pantries of the fit and health-conscious because it’s high on the glycemic index scale, meaning its sugars are quickly digested and surged into the blood stream, spiking blood sugar levels and increasing your odds of obesity and diabetes. But there’s no denying it takes Herculean effort to forgo the breadbasket when you’re eating out. Scientists addressed the dilemma by changing the formula of white bread without compromising its texture. To do this, they extracted black rice anthocyanins, a vibrant pigment that naturally occurs in the grain as well as fruits and vegetables like grapes, blueberries, and sweet potatoes, and infused it into white bread. Aside from the bright purple color, research has found anthocyanins are super high in antioxidants, which can reduce inflammation, prevent cardiovascular disease, lower obesity risk and diabetes, as well as ward off cancer. Due to a chemical reaction with the bread’s starch, the added anthocyanins effectively slowed the rate of digestion by 20 percent. Though that doesn’t make it any lower in calories (the amount of wheat flour and starch remains the same), you’re getting a slower release of energy so you use those calories over a longer period of time. And yes, the majority of the antioxidants withstand baking: 80 percent of the healthful qualities are preserved in the bread’s crust and crumbs even at 392 degrees Fahrenheit. 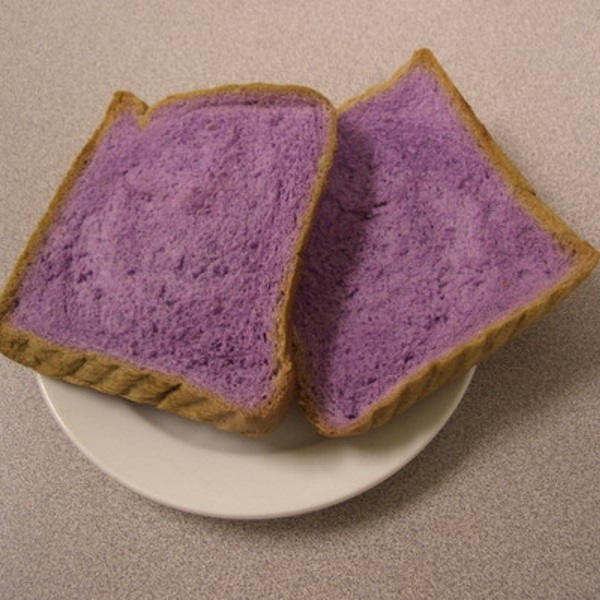 The Singaporean scientists’ purple bread isn’t commercially available yet, but bringing the superfood to major food manufacturers is in the works. Rich in cancer-fighting antioxidants, low on the glycemic index, and made entirely of natural compounds, this may be the greatest innovation since sliced bread.